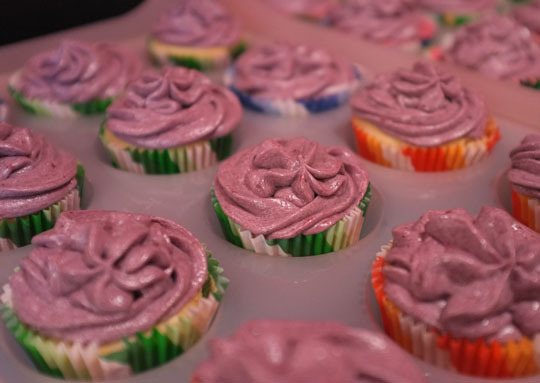 As I have tended to concentrate more on flavors than decorating, this was my first time working with gum paste for my own cupcakes. Gum paste is similar to fondant except it dries hard. (I also think it tastes a little bit better, but it still doesn’t taste wonderful!) That makes it more appropriate for detailed decorations. I drew a 1 cm grid on parchment paper to provide a guide, flipped it over and taped it to a white cutting board. That gave me a clean and stick-resistant area to work. 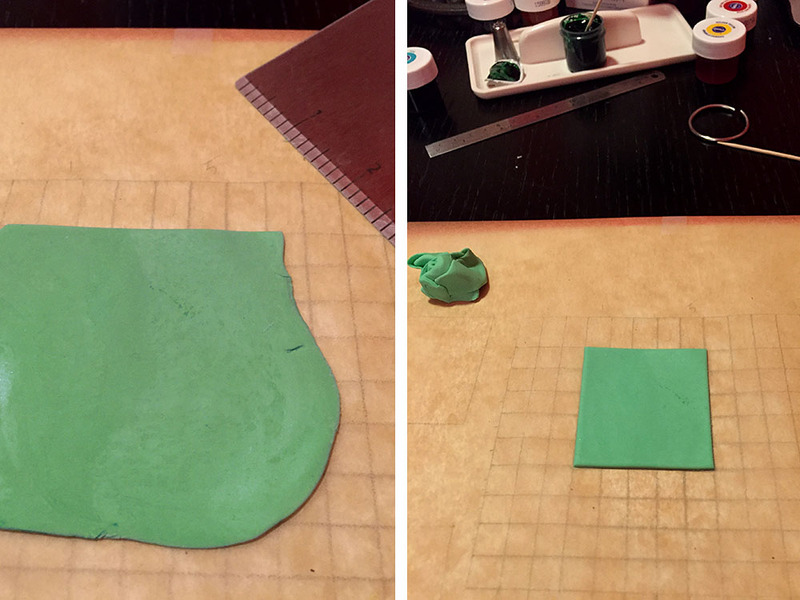 The gum paste was white, so I colored a batch with food coloring gel to a light green before rolling it out onto my grid. (Note: Use gloves if you don’t want your hands colored like mine were! The easiest way to color is to work the gel into the paste by hand.) I used a pastry cutter to cut out 5×5 cm squares. I scored them gently with a grid, not cutting all the way through, to provide the base for my Creepers. 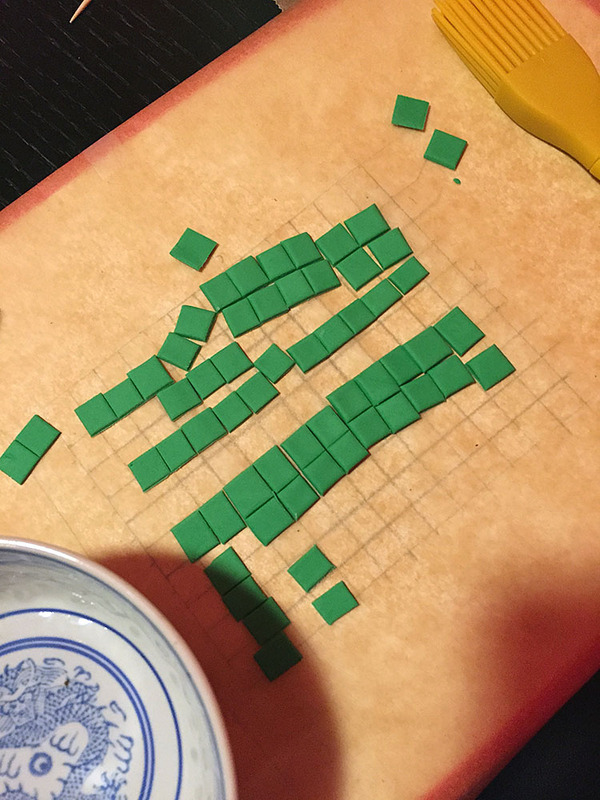 I colored other batches of gum paste a darker green and black for the details, cutting 1×1 cm squares. 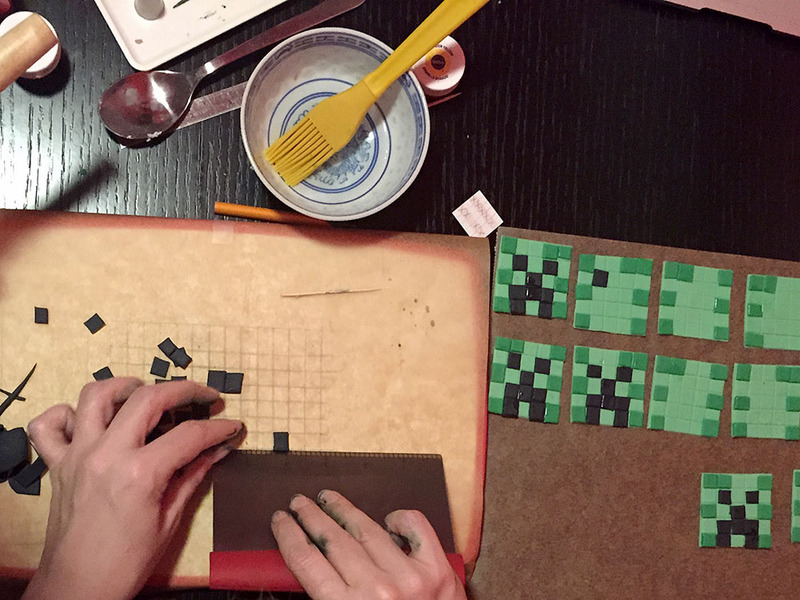 I applied water with a brush to glue the small squares onto the larger to make my Minecraft Creeper cupcake toppers and let them dry overnight. 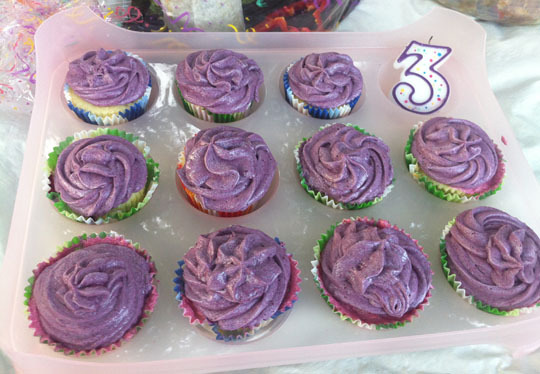 The cupcakes were dirt-color (chocolate! 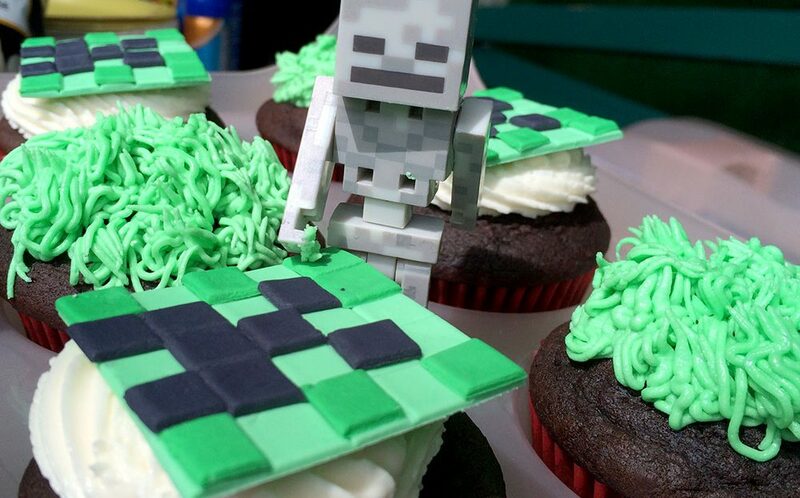 ), and vanilla buttercream attached the Creepers. As creating the toppers were time consuming, I made enough for half the batch, piping buttercream “grass” onto the rest. 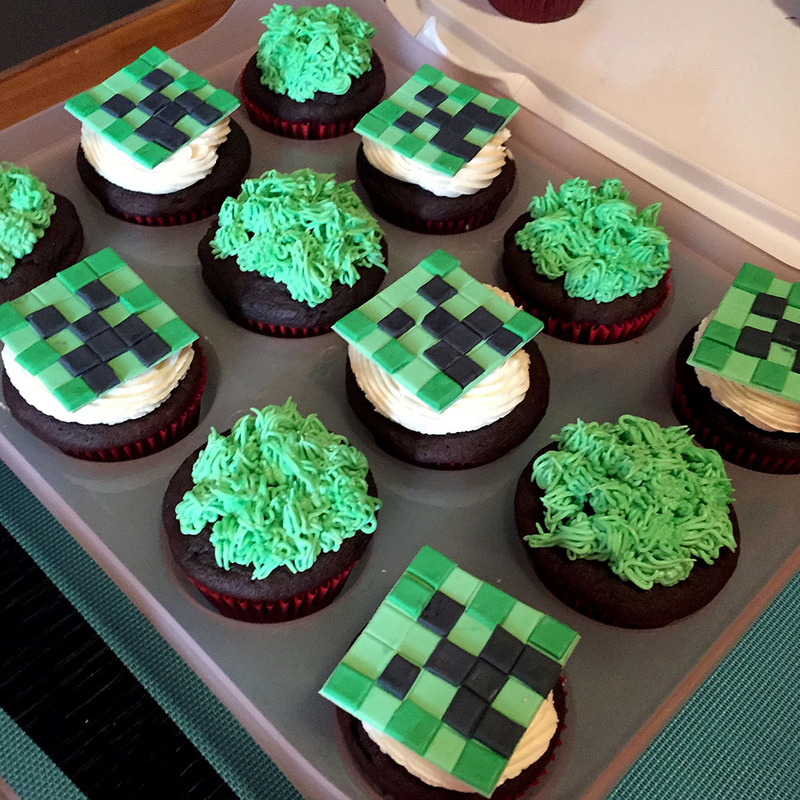 The birthday boy was delighted with his Minecraft cupcakes, it was totally worth staying up late and dyeing my hands green and black! 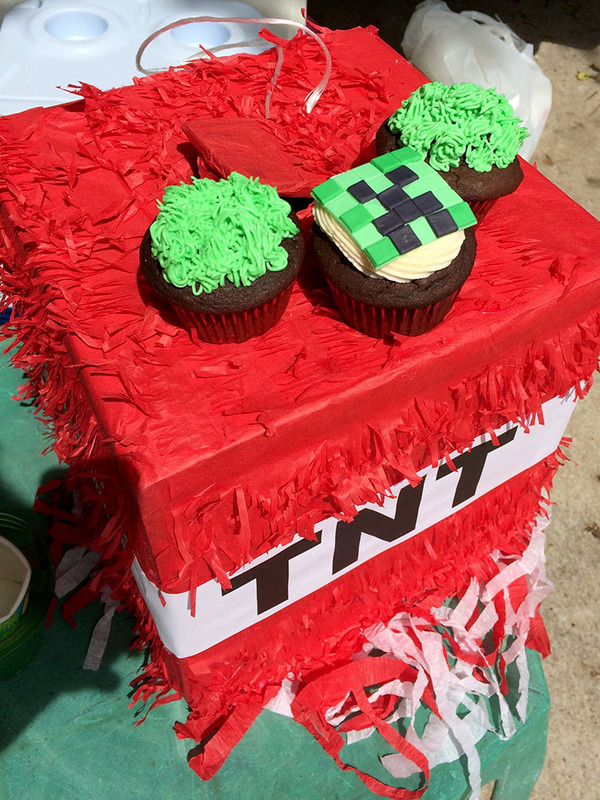 The TNT piñata was a hit. Gum paste may harden, but it wilts in the summer sun! The birthday party guests didn’t seem to mind at all. 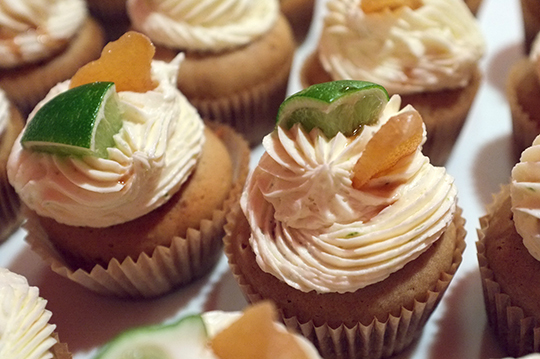 I wanted to make a cupcake version of a mixed drink for a cocktail party, and rum cake seemed a good place to start. My great-grandmother made rum cake, and it would often show up on our Christmas Eve dessert buffet. I fondly remember its buttery slightly exotic taste. Adding ginger to rum cake batter to stand in for ginger beer and topping with lime and more ginger, I made a cupcake “Dark & Stormy” (the cocktail is made with dark rum, ginger beer and lime). They were well received by the cocktail party crowd. Rum cake is traditionally made in a Bundt pan, and it is denser than regular cake. 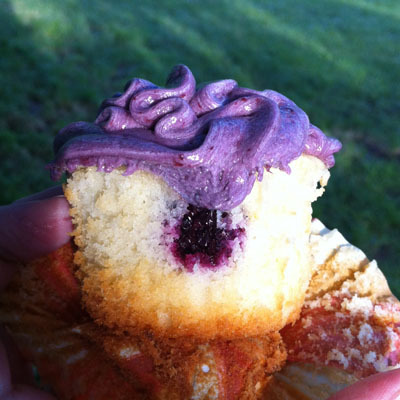 I forgot this at first and was upset that these cupcakes came out dense. 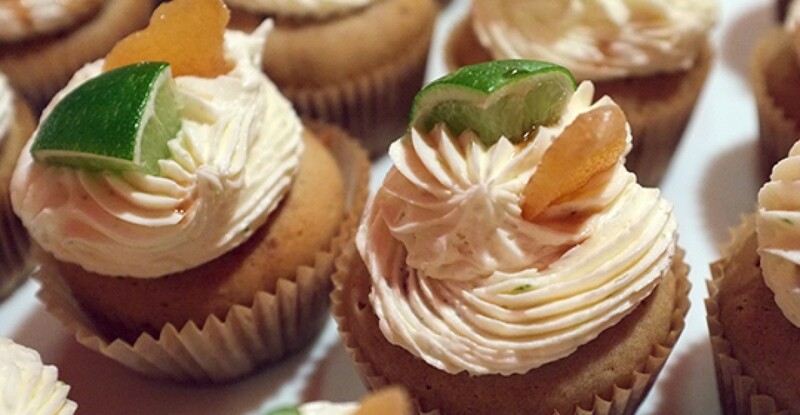 Someone at the party reminded me of that (and also said that the cupcakes were perfect, so surely a reliable source)! 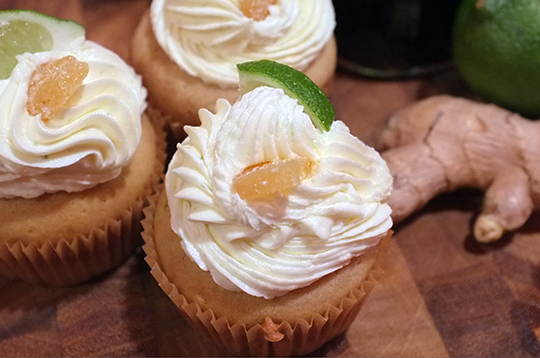 I added a fresh lime wedge and crystallized ginger after I frosted these, completing the “cocktail” (caketail?). See recipe and notes below! I had fresh ginger, and it really seems the way to go. Note, you can use more than I used above for a stronger ginger taste. Using ground dried ginger will be a different taste. It’s a little like making a dark and stormy cocktail with ginger ale rather than ginger beer. 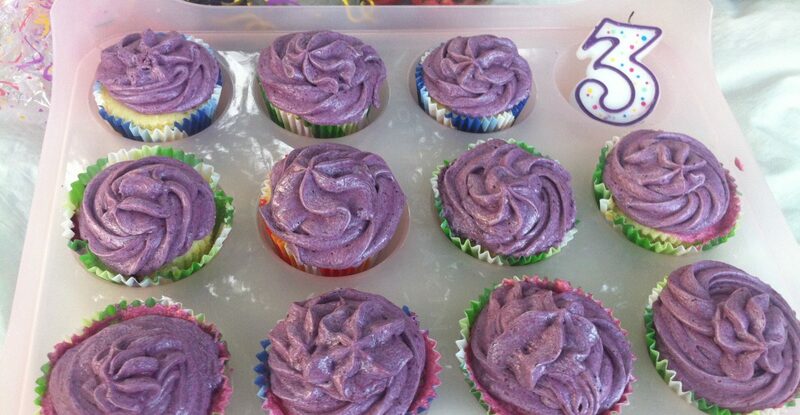 If you must substitute, use 1/4 teaspoon dry ginger in the cupcakes and probably less than 1/8 teaspoon in the frosting. 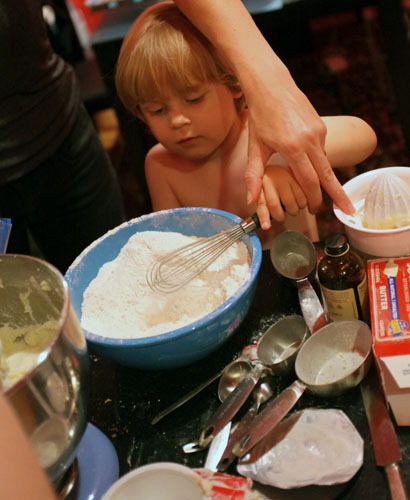 Sift together flour, baking soda, and salt, then mix in grated ginger. Slowly add cooled rum mixture to the egg mixture and combine on medium-low speed until incorporated. Add the sifted flour mixture in thirds to the rum-egg mixture. Scrape down sides to make sure you get all ingredients combined. Place 24 cupcake papers in pans and fill each about 2/3. 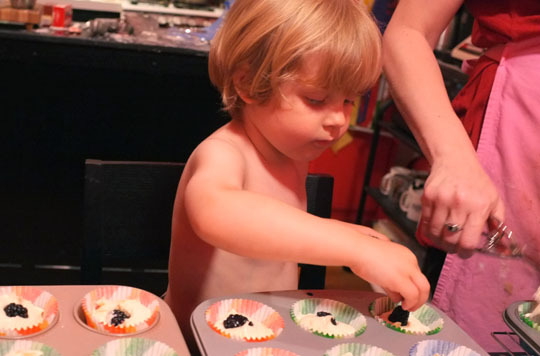 Bake for 18-24 minutes (turning halfway through) or until the tops are firm to the touch. 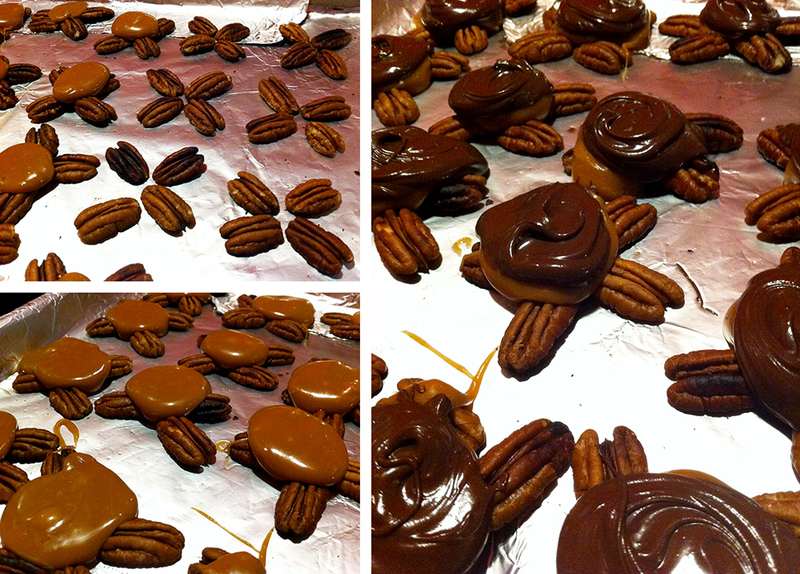 Let cool in pans on wire rack for 5 minutes, then remove from pans and let cool completely before frosting. 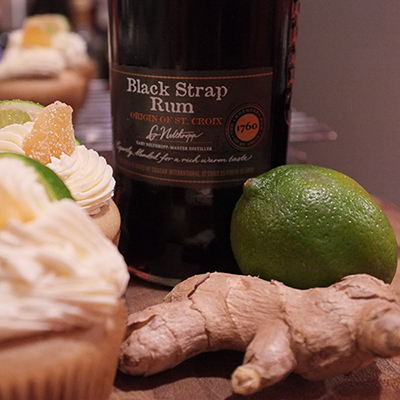 Optional: Dribble a teaspoon of rum over each baked cupcake when you take them out of the pans. 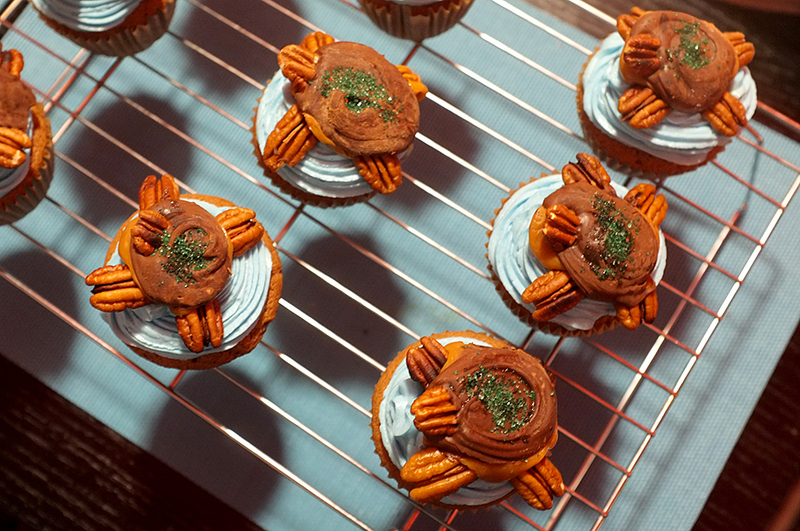 I also added a few drops on top after frosting. A friend gave me a mini donut maker for my birthday in January, and I’d been wanting to try it out. 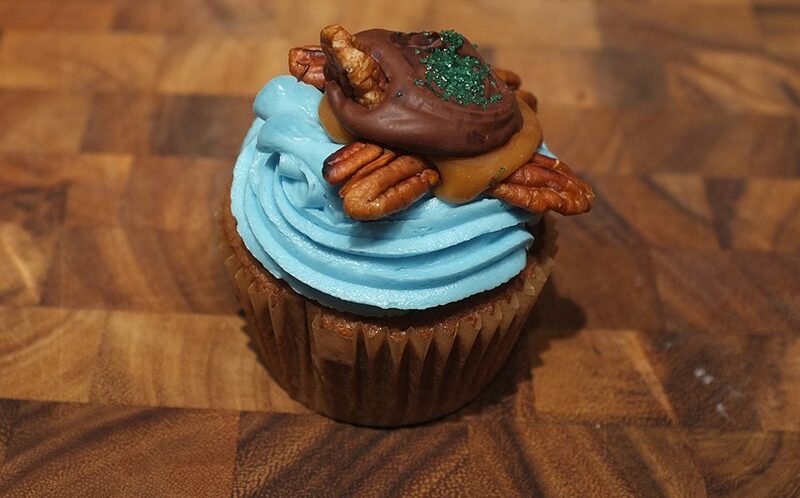 Putting donuts on cupcakes was—surprise, surprise—my first thought. Another friend’s birthday party gave me the opportunity to play with my new toy! 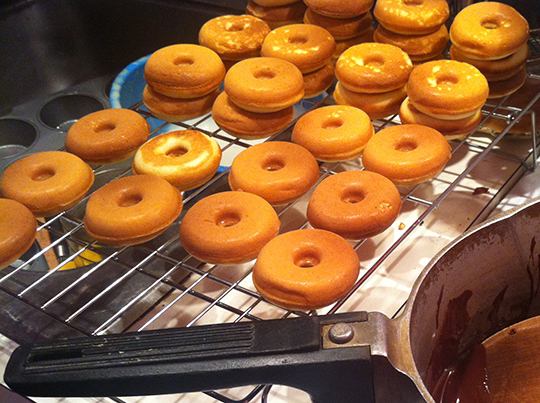 The Bella Mini Donut Maker works like a waffle iron and makes baked donuts, not fried. Because Bella recommends you discard the first batch (due to possible slight smoking on first use of a new machine), I doubled the vanilla donut recipe and froze the leftovers. They’ll make a nice quick dessert sometime, maybe sporting some of the extra icing from past cupcake projects that I also have in my freezer. 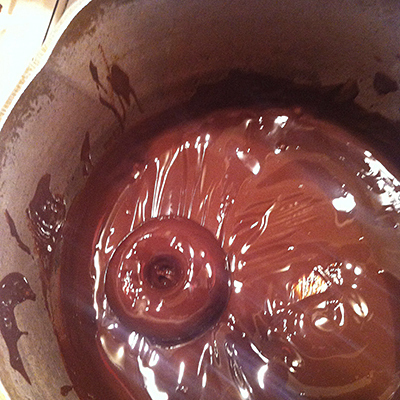 I melted a dark chocolate candy bar over low heat and stirred in a splash of pure mint extract. 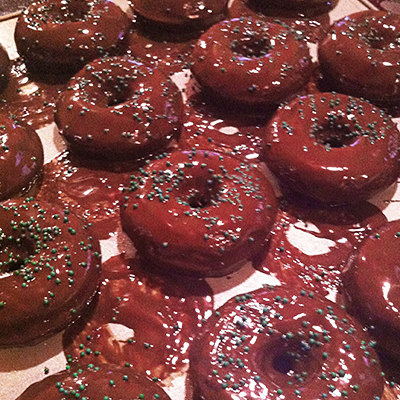 I dipped the teeny donuts in this gooey goodness, fully coating each all around. I lifted them out of the pot with tongs and put them on a cookie sheet I’d lightly sprayed with oil. Sprinkling them with green, a visual hint at the mint flavor, I left them to dry. I made regular chocolate cupcakes (the same from here and here) from my favorite just-rich-enough chocolate cupcake recipe, and I whipped up a buttercream with mint extract. My frosting came out very fluffy this time and had a slight foaminess. I don’t know if it was because I used soy milk, though I’ve done that before, or if I unintentionally mixed it somewhat longer than normal. Perhaps it was a combination of both or some other factor. Tasted just fine! I tried a new tip for frosting the cupcakes, an Ateco 806. I went a little heavy on the icing until I realized I might run out. 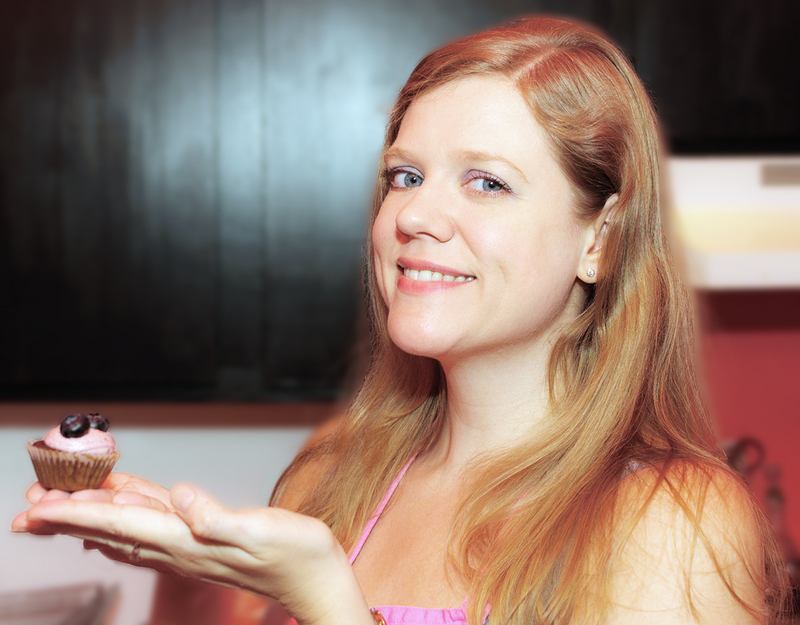 I wasn’t very precise with this larger tip than I normally use on cupcakes (need practice! ), but I just wanted good dollops of “glue” to hold my delicious creations together! 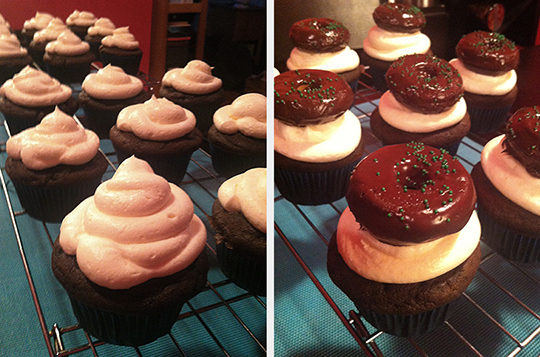 As I constructed these, I laughed at both the brilliance and the ridiculousness of putting donuts on top of cupcakes. Really, I giggled out loud. They were well received by the birthday party guests! I also donated one to a newly married couple celebrating with friends at the next table. 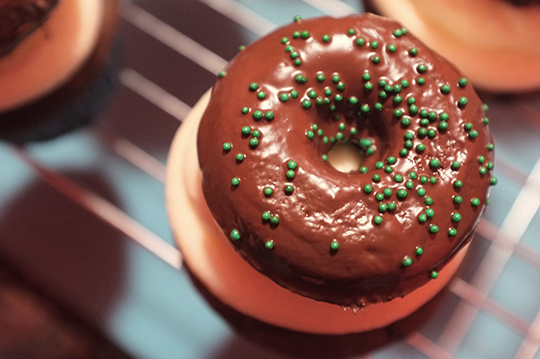 You can’t keep cupcakes topped with donuts to yourself.